I can’t believe all the kids are going back to school already! My son doesn’t go back until next week, but I’m already starting my fall nesting rituals. This time of year I love to add a few new layers and textures. It’s fun to bring out a few fall-ish things like warm throw blankets for the backs of chairs, a tablecloth in the dining room, and a few rugs. Our entry has been in process for quite awhile (years!) but lately it feels like it is finally coming together. Especially now that I’ve painted the front door and finally have a new rug to warm up the space! Yay! With dogs in the house, I’ve found indoor/outdoor rugs to be really easy to keep clean. When they get dirty, I can just wipe them off with a rag or even take them outside on a sunny day and hose them down. The rug, not the dogs. The dogs get to go in the tub! Ha! The indoor outdoor rugs are perfect for our no-fuss style in a house with several pups running around. My new rug is the the Samode Rug by Dash & Albert from Rug Studio! I think it has such a fun pattern and adds just the right touch of softness without being too heavy or wintry looking. Jack & Lily really like it, and I’m sure Bella is going to love it next time she visits too. *Update 2019* Have you seen my rug designs for Dash & Albert? What a dream come true! Click here to see them! PS. If you missed the post about my new fiddle leaf, you can find it here! A full list of my paint colors can be found here. Details about flooring can be found here. Tutorial for my blue DIY Bottle Lamp shown in the top photo can be found here. Have you tried indoor-outdoor rugs in your house? I love the pattern on this rug! And the fact that it is an indoor/outdoor rug makes it even more perfect…I have a beagle who sheds like crazy! Your pups are adorable! Love the pattern! And your pups look just too cute. Love your indoor/outdoor rug! I, too, have the same type of rug in my entry for all the same reasons. I don’t think I would have any other type now that I know how easy they are to keep clean. Yours looks great!! Love the indoor outdoor rug! I am definitely going to try these. Are those GOLDENDOODLES-your puppies? We have a Goldendoodle and he is just the very best dog, will never have any other breed of dog. Just love all of your designs, can’t wait for your new books! Love it!!! perfect for your entry!!! I am also so excited to see the new cabinet in your front room!!! Love your decorating. What is your paint color? Yes, I love them ! Had one in our kitchen and in our new home put it on the terrace. They last forever and can take whatever tries to hurt them !!! I love Dash and Albert! 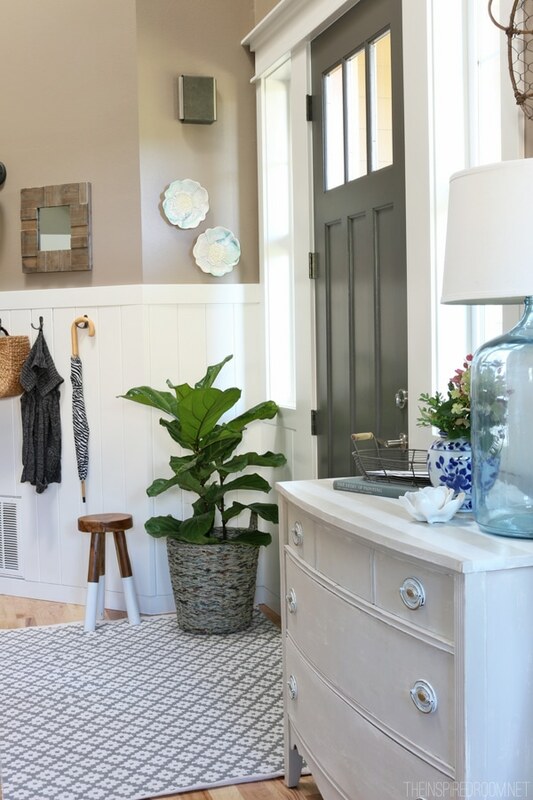 I have 3 of their rugs in my house – mudroom, foyer and kitchen. Thinking about getting another for my dining room. With 2 kids and 2 dogs, they are the most beautiful and functional rugs on the market. Nooooooooooo…. Say it ain’t so! This has been such an amazing sunny summer in Seattle, I don’t want fall to come for at least another month! That said, I’m on board with indoor outdoor rugs. I’ve got one in the basement and kitty has barfed up on it several times and it just wipes clean! I’ll never use anything else in the basement again. Hi! I too have a front entryway that needs an indoor/outdoor rug. My problem is the gap under my door leaves VERY little room to place the rug efficiently in order to minimize the area of “dirty” between doorway and rug. Does anyone have any suggestions? Maybe I’m viewing the situation from the wrong “angle”? Sometimes I am not very good at thinking outside of the box. I too love indoor-outdoor rugs with dogs. We have a lab and a golden and tomorrow getting a Scottish terrier. 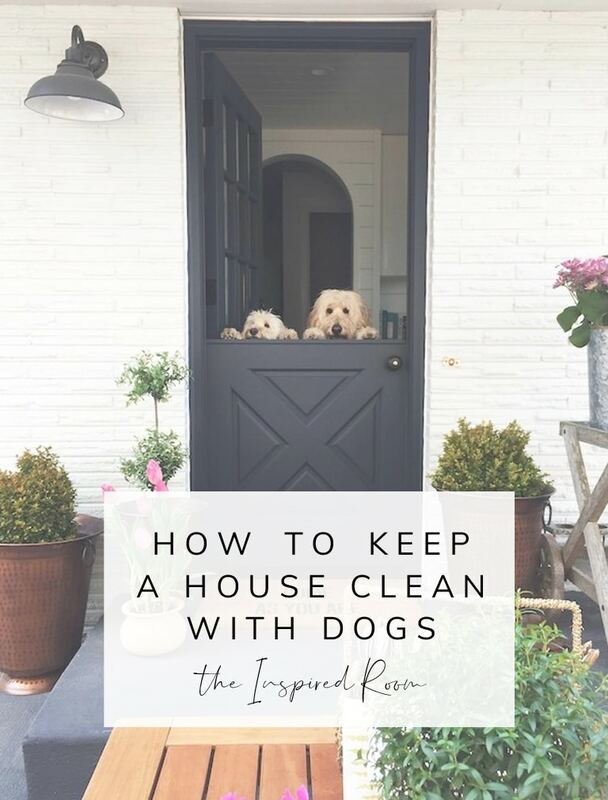 We have hardwood throughout our house so cleaning up doggy prints is easy but I feel rugs at doors are a must and indoor-outdoor are better because they seem to be more tightly woven and take more abuse. Using an indoor outdoor rug for the entry is a great idea, especially for people with kids and pets. Ballard Designs has great indoor/outdoor rugs. I have one in my entry way. grey/white chevron pattern. Love it, it’s so easy to keep clean and it’s thin so it dosen’t get caught when I open and close the front door. This is looking awesome! I would like even one smidgen of your decorating sense! The rug looks great with your awesome door! I purchased my first indoor/outdoor rug this past year and so far really like it. I actually have a spot on the patio that could really use one but even leaving it out seasonally I am not sure if they could handle our usually rainy PNW weather. Any thoughts? Cozy! Melissa I see a new kind of coziness creeping into your home. It’s perfect for fall. For Chillincali: You said you don’t have enough clearance under the door for a proper rug. 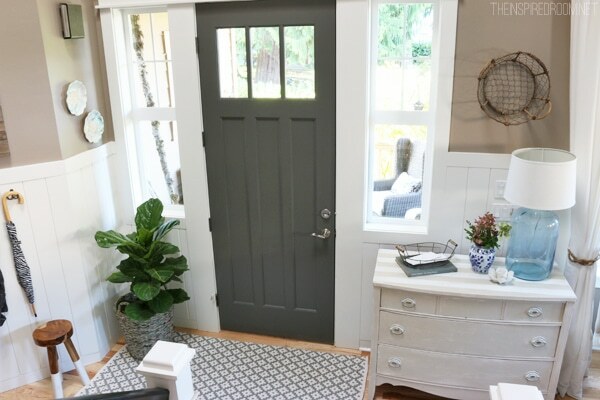 My back door is the same way and this is what I did – I found the thinnest door mat in a solid color that matched the room. I may have found it at Lowe’s or Target, can’t remember. THEN, I placed my rug farther back, so I don’t have to worry about the clearance. The mat matches the rug and the room, so, that was my solution. You don’t have to step in on a clean/bare floor that way. Melissa, I continue to enjoy your blog and you have inspired me so much. I just have to figure out how to make and keep my house clean! My outdoors is nearly perfect at all times, but the inside, well, not so much! Thanks for all of your ideas and give the dogs a treat for me. I love your collected look you’ve achieved in the past few years. So pretty! The dogs are pretty too, lol. When will you be doing your 2014 Fall nesting series? I look forward to it each year and have not seen any posts advertising a “start date” so I’m getting antsy :) Hoping that it will start very soon so I can get inspired for this year’s fall decorating. Indoor/Outdoor rugs are the only ones I use in my house, with 5 cats and 2 dogs it can get dirty easy. I have had 2 of mine for yrs and when I clean them I pour bleach directly on it and scrub it with a long handle scrub brush, and once a yr I clean them really good with a pressure washer. I love them they don’t fade or fray from the cats picking on them. I lucked out 3 weeks ago when I found at Lowes 2 blue and white nautical looking 5×8 indoor/outdoor rugs for $14.99, they changed the whole look of my patio. Can’t go wrong with an indoor/outdoor rug. 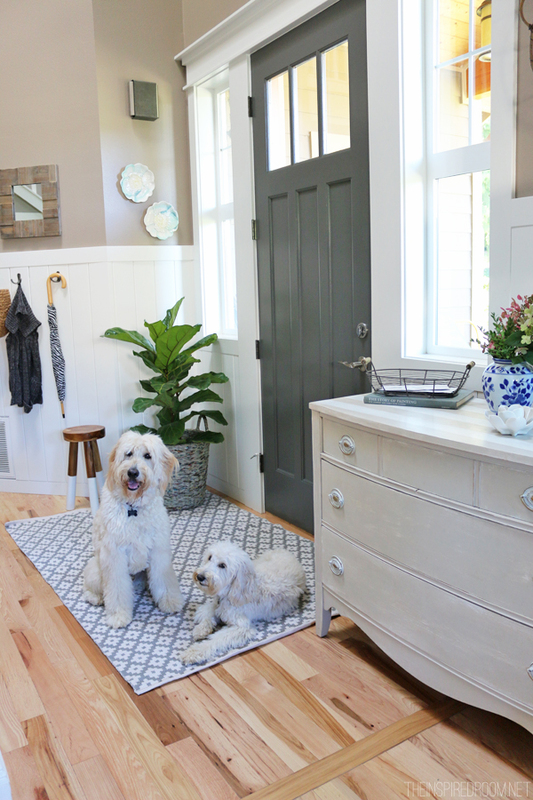 Love your entry….and it is even more cute with the puppies. Happy Day! Do you mind sharing the size you chose? I like the ratio of the rug to the door size and I think I’m going to order one now! Hi Melissa, What color is the rug? Charcoal? I can’t tell. Thanks! love the rug never thought of using indoor outdoor rug in the house. I have two beagles with enough do hair to knit a sweater so rugs were always a problem. Maybe now I’ll look at indoor outdoor thanks for the tip. Jack and Lily so cute.. In door/out door rugs are the best and yours is beautiful. I have three dogs and they are constantly shedding and bringing in dirt. Thanks for the inspiration! I’m wondering what type of wood your floors are. I’m sure you mentioned it at one time in one of your blogs but I missed it if you did. Hi! Love your blog – where is the cute little side table from? Love your front door/side windows. Any idea who is the manufacturer of these? The contrast of the door to the white side windows is stunning!